On his latest album, innovative Chicago jazz saxophonist Shawn Maxwell wants you to know what's on his mind, or rather, the music that's in his mind. I had the chance to talk to Maxwell about the new album and upcoming showcase. Q – Great talking to you again. There seems like there should be a story behind the name of the album, "Music in My Mind." Is there? Is this the music that was always in your mind that you are now getting out to the world? Yes, kind of. I’ve mentioned in past interviews that early on in my career, I felt like I had to write and record a certain way. I was constantly trying to fit into a certain box of what I thought people wanted to hear. Over the last handful of years, I’ve grown more comfortable in my own skin and have decided to embrace exactly what I want to do. "Music in My Mind" does represent exactly what I have been hearing, and wanting to do, for many years. My compositions are the soundtrack to my life, encouraged by the people, places and things around me. I take all of that in and then mix it in with different genres and we ended up with our latest album. Q – This is the second album you have made with the group of musicians called New Tomorrow. What do you like about working with them? How do you think the band has evolved since the first album? 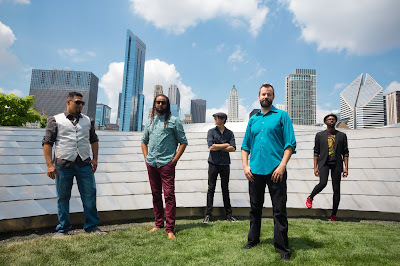 The musicians involved in this group are some of the best in Chicago and beyond. Working with them is always a pleasure. Not only is it really fun, but we’re constantly pushing each other to go in different directions. Things never stay the same, which keeps us ever on our toes and growing as musicians. It is a very rewarding experience working with these individuals. This group has become very good at taking my compositions and both staying true to my interpretation of them while also adding in their own personal touches. This is a big reason that our tunes, and the overall album, have a unique feel and flavor. Over the last few albums, you can hear that continue to grow as we continue to work together. Q – How do you think your playing has evolved since the last album? I’m constantly reevaluating how I approach my playing, so hopefully it’s not only evolving per album, but per week. From our last album to "Music In My Mind," I feel like I’m trying to build more and tell a better overall story. I try to think about how I can add to a tune and complement what all of the other musicians are doing. This has been an approach of mine for a long time now but, as the years go by, I feel like I grow stronger with this. Q – Of course, you have a residency at Jazz Showcase to celebrate the release of the new album. What should people expect from the residency? Will you be playing a new set each night? “Fun,” “different" and “new" are a few words I’d use. With the performers and compositions we have lined up, I don’t see how anyone will have less than a good time. We also tend to mix different genres into jazz so there will be a good amount of change per tune. We will be featuring new tunes from our most recent album as well as newer versions of older Maxwell tunes from past albums. We have 79 tunes to pick from so, while we will repeat a tune here or there, every night will be very different. We also have a few special guests each night. On Thursday, we are joined by trumpeter Corey Wilkes. Friday brings in vocalist Dee Alexander as well as trumpeter Victor Garcia. Saturday brings back Corey Wilkes on trumpet as well as vibraphonist Stephen Lynerd. Sunday we close out the weekend with Mr. Chad McCullough on trumpet. Q – Do you have any favorite venues in the Chicago area? Chicago is a great town for not only jazz but all genres of music. There are so many places that we enjoy performing at that I fear messing up and forgetting any. That said, it’s always a great and magical time when get to perform at the Jazz Showcase. Q – What do you think of the Chicago jazz scene and where do you see yourself fitting into it? Do you draw inspiration from any other musicians in the area? The jazz scene, like any other, is always moving and changing. I try not to think about how I fit into it and instead focus on doing my thing. I am inspired and driven by all musicians and everything they do. There is always something to learn and I try to keep my eyes and ears open at all times. Luckily Chicago has several great musicians so inspiration is pretty easy to come by. 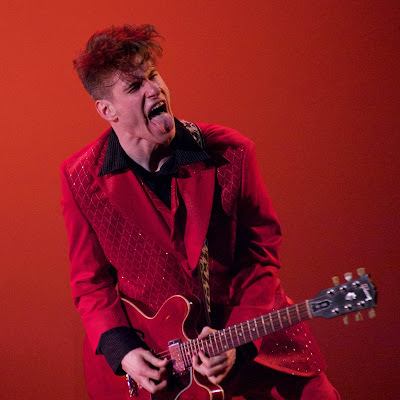 His wildly energetic shows have earned Jimmy Nick much acclaim in the Chicago area and beyond. Nick, a Crystal Lake native, has headlined at Buddy Guy's Legends in Chicago and performed with the likes of John Mayall, Samantha Fish, Pat Travers and Los Lonely Boys. In 2013, he won the Chicago Blues Guitar Slinger Challenge. Nick and his band, Don't Tell Mama, will perform from 7 to 9 p.m. July 14 at Itasca Fest, which will be held at Washington Park 350 E. Irving Park Road, Itasca. Nick and his band will also perform at 9:30 p.m. July 27 at The House Pub, 16 S. Riverside Drive, St. Charles. A full listing of his upcoming shows can be found at his website at jimmynick.com. I had the chance to talk to him recently about his latest musical endeavors. Q – I know that you grew up in Crystal Lake. Do you still live in the area? Oh, yeah, I'm still in Crystal Lake. Q – It seems like you really play all over the place, which is good. You got to, man. I have a great following in the Chicago suburbs and even in the city now. I headlined at Buddy Guy's Legends in March and I've played in different states. I'm trying to get out. Q – The fact that you are now headlining at Buddy Guy's, how does that make you feel, given the caliber of the musicians that play at the club? It's awesome, man. It really is. It's a badge of honor, because that's the top club, especially for blues, in the city of Chicago and I would day the country. Last time I was there, he got on stage with me, which was an incredible feeling. We were doing our set, and then he started doing some Chess Records blues stuff. It was a great time. I just kind of stood back and just played the chords with my rhythm section and just let him do his thing. I was very excited versus being nervous. Q – Growing up, was he one of the musicians that you listened to? One of my favorite albums is probably Buddy Guy's "Sweet Tea." His playing and singing on it really stands out to me. I definitely listened to a lot of Buddy. Q – It seems like you have been busy. In December, you released the album "Dangerous Decisions & Bad Things." What were your goals for the album and do you think you accomplished them? There were all kinds of goals. There was kind of a time limit goal, because I had a show already booked for the Raue Center in Crystal Lake for New Year's Eve. So I thought it would be a perfect opportunity to release a new album on that date. I booked the studio time, and we got in the studio in November. We did the bulk of the album in a day and a half. It was incredible. It's hands down the best sounding CD I've put out. That was a goal that was accomplished. Another goal was to have a more mature sound from the last time I was in the studio, with more mature guitar playing and singing, which I think really comes through. If you put on "Rare Breed," which was my 2014 album and then this new one, you're going to hear the maturity in my playing and my voice and even the songwriting. I also think it sounds really clean. I recorded it at Waysound Recording Studio in Fox River Grove, and owner and audio engineer Justin LeBreck engineered it and co-produced it with. He did a phenomenal job. Q – You were talking about how it didn't take long to record. Were you trying to replicate your live sound at all? We basically did it pretty much live. We rehearsed two days before and then went in the studio. The drums, bass, rhythm guitar and a scratch vocal were all done live. It was a pretty straight process, very live, very raw and a lot of one takes. What you hear on the CD is damn near live. Q – It does seem like there are a lot of albums that are overproduced, where there is no warmth to the album or anything. I 100 percent agree. You want that grit and that soul to it. It's part of the art form, just that live energy. That's what people want. Q – It seems like you like to roam through a lot of musical genres, including rockabilly. We do some Johnny Cash stuff that people love. I have a bit of that old country in me, and like you said, rockabilly. I love that, too. Q – You also put on an energetic show. It seems like you're really trying to energize the crowd through your music. I think that is one of the most important things. People want to see something, and they want to feel a part of it, and you really have to cross that line when you are live. You want to give it your all, all the time, and make them part of the show. Q – Speaking of your shows, you've won several blues challenges. Does that make you feel good, being recognized by your peers like that? Is it kind of like a feather in your cap? Oh, yeah. It's cool. In 2013, I won the Chicago Blues Guitar Slinger Challenge. That was pretty cool. That was held at B.L.U.E.S. on Halsted in Chicago. To win it in front of that crowd was really cool. But I don't focus on winning blues challenges as much as trying to consistently put on the best show for my audience. That's the real thing to worry about. Q – How would you describe your guitar playing? It's very straight ahead, not fancy, kind of a mix of rock 'n' roll and old Chicago blues – Chuck Berry, Angus Young, Elmore James, a lot of the Muddy Waters stuff and a lot of Bobby Rush's funky guitar licks and rhythm. I'm really trying to focus on rhythms and riffs now and being tight with the band versus playing a million notes a second kind of thing. I like straightforward stuff. Q – I understand you turned 28 in December. Do you see yourself as bringing the blues to a younger generation? Yeah, definitely. My shows have been getting the younger audience. If you can get them to like it, that's really the goal, to get them dancing and having a good time. They're getting it in their heads and they don't even know they're digging the blues, so it's a cool thing. One of my favorite compliments is getting some younger people come up to me after a show and say, "Man, we don't even like blues, but we love you guys." That means a lot, that I'm kind of crossing over and getting more people on the blues stuff.